We have added 2 more work spots on the farm, and what a difference! For cleaning vegetables, it is best to use as little water as possible while removing as much soil as possible. At the same time, we want to avoid creating mud. While the pigs love a good belly flop in the mud farmers prefer to have as little caked on footwear as possible. Mud is heavy! A bit of wire mesh over a grassy spot and there it is. 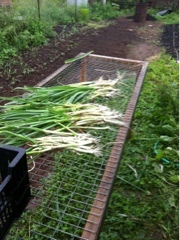 Spread out vegetables, a quick hit of the hose and into the crates. Little things make a big difference!